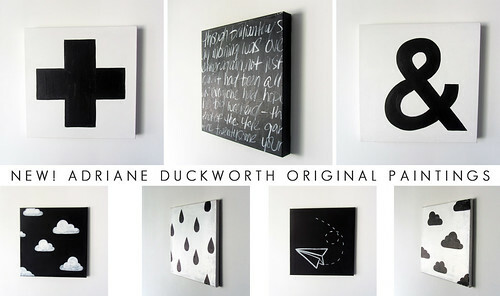 Well tonight I have been busy adding some new pieces to the shop, and yes, I'm on a black-and-white-only kick. I've come full circle. Don't worry, colour will make it's return. I'm experimenting with new nursery paintings (the bottom row are designed for nurseries and kids' spaces, though they could work anywhere really). Have some more ideas that I hope to work on soon for this line. Oooh how I love painting. Love love love. Anyway, it's way past my bed time. Sorry for the bursts of posts followed by days of nothingness. Summer has gotten the better of me. Aw you're so sweet Lori!! I looove these paintings for a nursery. The airplane is awesome! Thank you sooo much Christine!!! !